Mulching is one of the most important ways to maintain healthy landscape plants. A mulch is any material applied to the soil surface for protection or improvement of the area covered. Mulching is really nature’s idea. Nature produces large quantities of mulch all the time with fallen leaves, needles, twigs, pieces of bark, spent flower blossoms, fallen fruit and other organic material. Mulches prevent loss of water from the soil by evaporation. Mulches reduce the growth of weeds, when the mulch material itself is weed-free and applied deeply enough to prevent weed seed germination or to smother existing weeds. Mulches keep the soil cooler in the summer and warmer in the winter, thus maintaining a more even soil temperature. Mulches prevent soil splashing, which not only stops erosion, but keeps soil-borne diseases from splashing up onto the plants. Organic mulches can improve the soil structure. As the mulch decays and moves down into the soil, the organic material improves the quality of the topsoil. Decaying mulch also adds nutrients to the soil. Mulches prevent crusting of the soil surface, thus improving the absorption and movement of water into the soil. Mulches protect the trunks of trees and shrubs from damage by lawn equipment. Mulches help prevent soil compaction. Mulches can add to the beauty of the landscape by providing a cover of uniform color and interesting texture to the surface. Mulched plants have more roots than plants that are not mulched because mulched plants will produce additional roots in the mulch that surrounds them. There are basically two types of mulches: organic and inorganic. Both types may have their place in the garden. An organic mulch is a mulch made of natural substances such as bark, wood chips, leaves, pine needles, or grass clippings. They decompose over time and need to be replaced after a few years. Inorganic mulches, such as gravel, pebbles and landscape fabrics, do not decompose. Organic Mulch Materials: Your yard “waste” can be recycled as mulch with the advantage of retaining the nutrients found in these organic materials, in addition to saving money otherwise spent in transporting and disposing of these yard waste materials. Leaves: A 2- to 3-inch layer of leaves provides good weed control. It is best to shred the leaves coarsely, using a shredder or your lawn mower. Whole leaves have a tendency to blow away, while finely shredded leaves do not allow water to penetrate. Oak and beech leaves help to acidify the soil for acid-loving plants. Leaves are usually easy to get, attractive as a mulch, and they will improve the soil once they decompose. After the leaves decompose, dig them into the soil and add a new layer of mulch on top. Pine Bark: A 2- to 3-inch layer of pine bark is good for weed control. Pine bark makes an attractive, usually dark-colored mulch. It can be purchased in various particle sizes, from shredded to large-sized particles, called nuggets. Large pine bark nuggets float in water and may not stay in place during a heavy rain. Pine Needles: A 2- to 3-inch layer of pine needles makes an excellent mulch for acid-loving trees and shrubs. Pine needles tend to interlock and stay in place better than most mulches, especially on a slope. This mulch is very attractive and allows air, water and nutrients to penetrate easily to the soil surface. Shredded Hardwood Mulch: This mulch is good at suppressing weeds. It does not wash away easily. It decomposes relatively slowly, and it is very attractive. 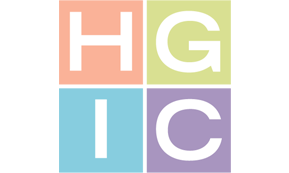 This is typically available as single ground, which has a coarser texture, or as double ground, which has a finer texture. Wood Chips: This material contains bark and pieces of ground up wood of various sizes and makes an attractive mulch. A 2- to 3-inch layer of wood chips provides good weed control. Small wood chips decompose very rapidly using nitrogen from the soil, which needs to be replaced by nitrogen fertilizer. Wood chips may attract termites. Wood chips are usually completely decomposed within 2 years. This mulch is an inexpensive way to cover woodland paths and provide a nice contrast to pine needles used as mulch in the adjacent beds. Leaf Mold: Leaf mold is composed of leaves that have begun to decompose. This makes an excellent mulch that adds to the quality of the soil. However, if it is well decomposed, it would be better to use it within the soil as an amendment rather than as a mulch on the soil surface. This is one of the favorite mulches used at the SC State Botanical Garden. Grass Clippings: The best use for grass clippings is to leave them on the lawn. They decompose rapidly, adding nutrients back into the soil. If you choose to use grass clippings for mulch, it is best to build up the mulch layer gradually using dry grass, not fresh clippings, to prevent the formation of a solid mat that can prevent water moving through it. A two-inch layer of grass clippings provides weed control as long as the clippings do not contain weed seeds from the lawn. Be careful not to use clippings from lawns that have been treated with herbicides, as these may affect sensitive plants. Pecan Shells: Pecan shells make a long-lasting, attractive, dark brown mulch that is effective in retaining moisture in the soil. Availability is limited to areas where pecans are processed. Hay & Straw: Never use hay (coastal Bermudagrass) for mulch since it contains too many weed seeds. Straw decomposes rapidly, so you will have to replenish it to keep the weeds down. Straw is not very ornamental and is best for a vegetable garden or over newly sown lawns. Straw will improve the soil as it decays. Because the straw is from oats, wheat or rye, there may be grain seed heads in the material, which may sprout. Gravel, Pebbles & Crushed Stone: These materials are permanent and are best used for permanent plantings such as foundation plants. A 1-inch layer of small rocks will provide good weed control. Do not use them around acid-loving plants since the rocks may add alkaline elements and minerals to the soil. These materials reflect solar radiation and can create a very hot landscape environment during the summer months. Landscape Cloth or Woven Ground Cloth: Materials woven of fabric, plastic or paper are available in various lengths and widths. The materials are treated to resist decomposition. Unlike plastic films, woven materials allow water and air to move through them. They are very effective in controlling most weeds, although some grasses may grow up through the holes in the fabric. Landscape cloth needs to be fastened down so it will not be pushed up by perennial weeds. Better moisture, temperature and weed control will be obtained by adding several inches of another mulching material on top of the landscape cloth. Ground Rubber Tires & Artificial Pine Needles: Mulches made of ground rubber tires and artificial (plastic) pine needles do not decompose, and unless scattered, may never need to be replaced. The use of these materials is relatively new, and both their effectiveness as mulch and their color retention is still being evaluated. Black Plastic: Black polyethylene film is very effective in preventing weed growth. However, it prevents the movement of rainfall and air into the soil (and roots need air). If the soil moisture does get below the plastic barrier, it may prevent the adequate drying of the soil, which may create anaerobic (without air) conditions and promote root rot of shrubs. Therefore, plastic is not typically recommended. If a solid plastic film is to be used, cut holes in the plastic to allow water movement through it. There is black plastic available that has small holes already in it to help with drainage. If exposed to sunlight, black plastic is broken down fast, losing its effectiveness as a mulch. However, if you bury black plastic in the soil, it will last for many years. Covering the black plastic with a layer of wood chips or pine needles will reduce heat absorption and mask its artificial appearance. Clear Plastic: Clear plastic will not suppress weed growth because light penetrates the film and raises the soil temperature, which may result in an increased growth of weeds in early spring. Aluminum-Coated Plastic & Foil: One layer of either one of these materials provides excellent weed control. These materials decompose very slowly, but they are very expensive and quite unattractive mulches. Mulching is a very important practice for establishing new plantings, because it helps to conserve moisture in the root ball of the new plant until the roots have grown out into the surrounding soil. The growth rate and health of trees and shrubs increases when there is no competition for water and nutrients from weeds. Mulch also helps to prevent tree trunk injury by mowers and trimmers. 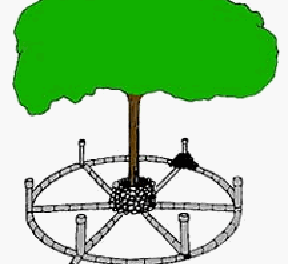 Newly planted trees require a circle of mulch 3 to 4 feet in diameter. Continue to expand the diameter of the mulched area as the trees grow. Mulch entire beds of shrubs, trees, annuals, herbaceous perennials and ground covers. Mulch can also be used to cover trails, driveways, and play and natural areas. Light-weight mulch such as pine straw can be used temporarily to cover low-growing tender plants to protect them from frost injury. The best time to mulch new plantings is right after you plant them. Around established plants mulch is best applied in early spring. This is when plants are beginning to grow and before weed seeds start to germinate. How often mulch needs to be replenished depends on the mulching material. Grass clippings and leaves decompose very fast and need to be replenished frequently. Pine needles and bark mulches typically last for around 2 to 4 years before the need to add more. Inorganic mulches such as gravel and pebbles rarely need replenishing. As the plants grow and fill in the bed areas, less and less mulch is needed. Before applying any type of mulch to an area, it is best to weed the area. Spread a layer of mulching materials over the entire plant bed. Keep mulch 2 to 3 inches away from the stems of woody plants. This will prevent decay caused by wet mulch and rodent damage during the winter. Keep mulch 6 to 12 inches away from the walls of buildings. Subterranean termites nest in the soil and feed on materials that contain cellulose. Termite treatments are applied to the soil around buildings, so keeping mulch away from walls will prevent termites from using it as a bridge to cross treated soil. Newly planted trees require a circle of mulch 3 to 4 feet in diameter; however, do not pile mulch against the trunk. For established trees in lawns create a circle of mulch about 2 feet in diameter for each inch of trunk diameter. Increase the size of the mulched area as the limb canopy widens. Try to apply the mulch at least 6 to 12 inches beyond the drip-line of the tree. Because the root system can extend two to three times the crown spread of the tree, mulch as large an area as possible. The amount of mulch to apply depends on the texture and density of the mulch material. Many wood and bark mulches are composed of fine particles and should not be more than 2 to 3 inches deep. Excessive amounts of these fine-textured mulches can suffocate plant roots, resulting in yellowing of the leaves and poor growth. Coarse-textured mulches such as pine bark nuggets allow good air movement through them and can be as deep as 4 inches. Mulches composed of grass clippings or shredded leaves should never be deeper than 2 inches, because these materials tend to mat together, restricting the water and air supply to plant roots. 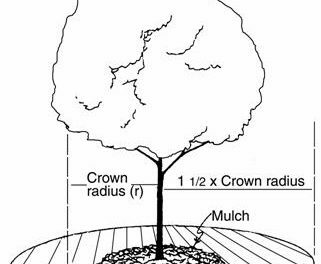 To determine how many cubic feet of mulch is needed, you need to calculate the surface area and the desired depth of coverage. There are 27 cubic feet in a cubic yard. One cubic yard will cover a 324-square-foot area with an inch of mulch. Figure out the square footage of your bed, that is the width times the length for square or rectangular shaped beds. The square footage of a circular bed is the distance from the middle of the circle to the outside, multiplied by itself and then multiplied by 3.14 (which is pi). Multiply your square footage by the depth desired (in inches) and divide by 324 square feet. This will tell you how many cubic yards you will need. Mulch Toxicity: Though mulch benefits plants, “sour” mulch can quickly damage plant tissue and lower the soil pH causing injury or death. Bedding plants and low-growing woody plants are most easily damaged. Symptoms include yellowing of the leaf margins, scorching or dropping of leaves and occasionally entire plant death. Although it may be several days before symptoms appear, spreading sour mulch can damage plants immediately. Sour or “acid” mulch is caused by poor handling or storing of mulch resulting in anaerobic conditions. Mulch piles need to “breathe” to prevent anaerobic conditions from occurring. In the absence of air, microbes in the mulch (mostly bacteria) produce toxic substances, such as methanol, acetic acid, ammonia gas, and hydrogen sulfide gas. Sour mulch smells like vinegar, ammonia, sulfur or silage. Good mulch smells like freshly cut wood or has the earthy smell of a good garden soil. Another way to determine if mulch is sour is to test its pH. Toxic mulch will have a pH of 1.8 to 2.5. To prevent mulch from turning sour or to cure sour mulch, mulch piles need to be turned once or twice a month, more frequently if the pile is very wet. Do not let the pile get larger than 4 feet thick in any dimension if the pile is not being turned regularly. A good aeration will eliminate the toxic compounds in 24 hours, but to be safe allow three days. Slime Molds: Slime molds are fungus-like organisms that can be a nuisance in mulch. They typically appear suddenly during warm, damp weather. The resulting masses may be several inches to a foot or more in diameter and vary in color, including bright yellow or orange. They are unsightly but harmless, feeding on decaying organic matter such as that found in new hardwood mulch. No pesticides are recommended. Simply scoop up with a shovel or pitchfork and remove. Matted Mulch: When thick layers of dry mulch are applied or existing mulch dries, some nuisance fungi can grow, forming a mat of mycelium (a mass of fine threadlike structures that make up the body of the fungus). The mycelial mat is hydrophobic (repels water). As a result, the mulch is not easily penetrated by water, which can prevent plants from receiving adequate water. Newly installed mulch should be watered to prevent this problem. If existing mulch is matted, break apart the matted layers with a rake or claw cultivator. Artillery Fungus: Occasionally, micro- organisms in mulches can become a nuisance. The shotgun or artillery fungus (Sphaerobolus stellatus) may cause serious problems. While it decays the mulch, it also produces fruiting structures that resemble tiny cream or orange-brown cups that hold a spore mass resembling a tiny black egg (1/10 inch in diameter). This fungus shoots these spore masses high into the air. They stick to any surface and resemble small tar spots on leaves of plants, on cars or on the siding of homes. They are very difficult to remove. To avoid damage to cars and houses do not use mulches that contain cellulose (wood). Use pure bark mulches, especially pine, or if the mulch is already in place, cover the hardwood mulch with pine needles. Stinkhorn Fungi: Stinkhorn fungi, such as Mutinus caninus, M. elegans, and Clathrus ruber can colonize hardwood bark mulch. The fruiting bodies or mushrooms often come up in the fall and exude a very unpleasant odor. Scoop up and dispose of the mushrooms as soon as they appear. Consider replacement of hardwood bark mulch, which contains a lot of wood, with another choice, such as pine needles, pine bark, leaf compost, or other composted mulch. Toadstools & Mushrooms: Some fungi found in mulches produce toadstools (mushrooms), and some of these are toxic to humans. As such, it is a good idea to destroy them when small children or pets have access to the mulched area.